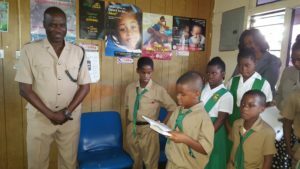 Eight Police Officers from the Mount Salem Police Station received an unexpected but memorable visit from students and staff of the Harrison Memorial Preparatory School on Monday January 21, 2019. The team which consisted of eight students, Principal of the School and Conference Representative in the form of Mrs. Carol Smythe James, conducted devotion and distributed copies of the book “The Power of Hope.” This, the Officers expressed, was not only timely but greatly appreciated. “I can’t recall having an undertaking like this where children or even a school would come to the station for an activity, instead of the station going there” said Inspector Franklin Hunter from the Mount Salem Police Station. “It was the first of its nature under my watch that I have seen something like this and I have been here since May 2018. It was absolutely great” he echoed. The impact forms part of the Church’s intentional approach to impact all aspects of community life, more so as time draws nearer for Christ’s imminent return. Mrs. Carol Smythe James, organizer of the visit, was pleased with the reception of the Officers and spoke highly of the glorious opportunity presented to the students as they shared in presenting the gospel to this critical group of society.